Whether you’re a trade show manager, association or corporate planner, there’s a lot to consider when it comes to planning your event. It’s essential that every aspect of the preparation process is air tight. 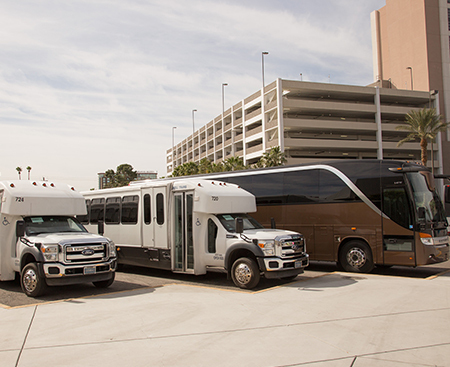 When it comes to ground transportation and getting people where they need to be, you don’t need to look any further than Production Transport. 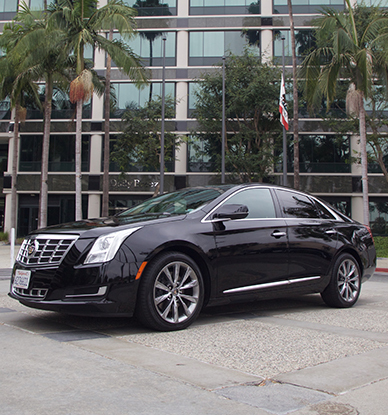 With over three decades of experience, we’ve been providing reliable premier transportation services. Our management meets with local contacts including the Police Department, the Department of Transportation, and the Convention and Visitors Bureau. We provide a citywide communication system allowing shuttle supervisors, operations managers, bus drivers, and the sales manager to stay in constant contact with each other. Drivers manuals are produced and distributed to all the drivers. This manual lays out every route, pick up/drop off location, and alternate paths in case of traffic so shuttle services can continue seamlessly throughout the day. 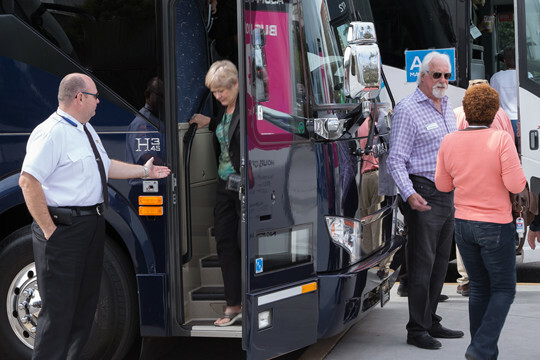 Throughout every event, our on-site staff records valuable data including passengers moved to and from venues, routes taken, and allotted travel time. This data will be presented to management and help our organizations with planning and preparation for future events. When you’re ready to start planning your next event, whether it’s for 1000 attendees or over 100,000, you simply contact our team to get moving. We’ll ask for information about your event, including estimated participants, location, and required services. We’ll work with you to figure out the rest and provide a detailed cost estimate. We’ve provided our transportation services for clients at some of the biggest convention centers around the United States and Canada. Our team has over 30 years of experience, and we know these areas as well as our own homes. Besides providing shuttle bus service throughout your event, we can coordinate a number of other invaluable special event transportation services that will benefit you and your attendees. Getting to and from the airport, the hotel, the convention center, or any local attraction with your group doesn’t need to become a difficult endeavor. 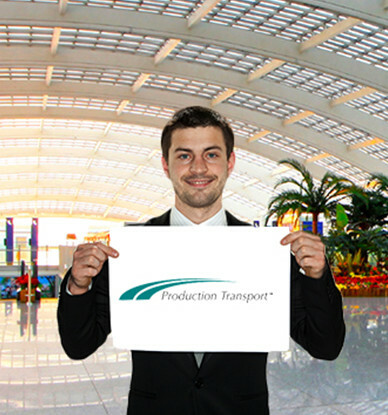 When you choose Production Transport, we work closely with you to create a transportation program that meets your needs, including vehicle sponsorship and golf cart shuttles. Let us become part of your solution. For many attendees, their first impression of your event might be how easy it is to get from the airport to their next destination, whether it’s a hotel or the convention center itself. Our goal is to make your guests’ journey as simple and hassle free as possible, and that starts (and ends) with the airport. The Production Transport operations team will be in place to flag down attendees at various terminals, and our reliable drivers will be ready to take guests where they need to go. You can expect the same attention to detail throughout and at the end of the event as when we safely get people to their terminal for departure. We know better than most how important exhibitor sponsorship is to your upcoming event. At some of the events we coordinate transportation services for, there can be over 100,000 people, and it’s a prime opportunity for companies to advertise new, upcoming products, or simply highlight their brand. Some of our shuttle bus options include full wraps, half wraps, and window MAX. We also have smaller but just as valuable sponsorship opportunities including shuttle headrest covers, golf cart toppers, and DVD services. 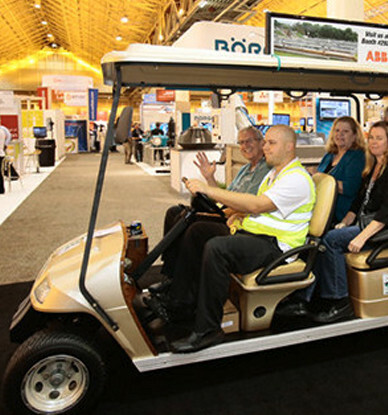 As part of our full service event transportation offerings, we also coordinate electric and gas golf cart shuttles that will run throughout the your event. Having been to many of these convention centers and other large event venues ourselves, we know that there is a lot of ground to cover, and not always enough time. We can help set set up golf cart shuttles for both around the exterior and inside some of the larger exhibition buildings. Different routes can be mapped out, and our safety-conscious drivers will make moving from point A to B fun for your attendees. 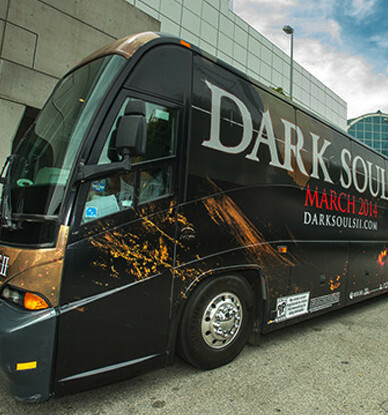 If you see one of the shuttles, just wave them down and they’ll get you where you need to be. While we will always treat each and every one of your guests with the utmost respect and care that they deserve, we also know you’ll have VIPs who need their own forms of transportation. We’re able to accommodate a number of situations since our VIP vehicle fleet includes luxury sedans, limos, SUVs, minibuses, and vans. Our services include a meet and greet for commercial or private airlines, uniformed and reliable drivers, and traffic and flight monitoring to avoid any trip missteps. We’ll help give your VIPs the ultimate transportation experience, whether they’re moving from the hotel to the event venue, or need a driver for a safe night out with colleagues and clients. Over the last 30+ years of working in this industry, our transportation company has learned what it takes to be a truly invaluable partner to event planners and trade show managers at various destinations across the United States and Canada. We typically start planning for major conventions and tradeshows a year in advance, and some of our preparation includes what was mentioned above regarding contacting local officials, and producing manuals for the drivers. However, while planning is such an important aspect of your event’s shuttle services the execution is just as, if not more important. Throughout the duration of your event, our onsite Operations Managers, all of whom are attired in clean, easily identifiable uniforms, will be there to assist your attendees. Thanks to the city-wide communication system we provide, they can be aware of every driver’s status, and make on the fly adjustments if needed to keep your transportation program operating at peak efficiency. Additionally, our Operations Managers have all been trained and certified by the American Red Cross in basic First Aid and CPR.